More than a clever name, Grayze offers solid takes on American classics with global perspectives. : Cheeky names pepper the menu at Grayze, but execution is anything but tongue-in-cheek. Favorites such as the now-ubiquitous mac ‘n’ cheese are given lush, new life, and plates like the "Porkshank Redemption" with white balsamic and fig suggest the kitchen could even stretch itself beyond current bounds. “Cheeks n Buns” with barbacoa and a gingery slaw are emblematic of the chef’s eclectic approach; french fries, here called "Ma Frittes," show that even the most common of denominators can still thrill. The wine list is small but well-considered, and a full bar offers a limited list of cocktails as inventive as the cuisine. 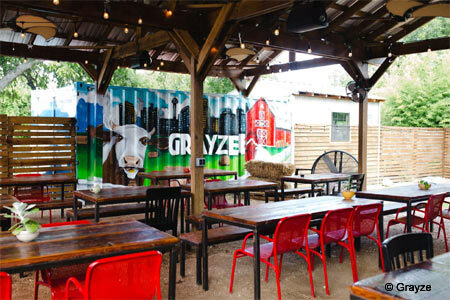 Grayze’s décor is rustic and cozy; a dog-friendly covered patio offers fair-weather dining options.